Keyboards or also keys are the ideal starting point for any musician who wants to get to know keyboard instruments or needs a simple keyboard instrument with a lot of sounds for their studio, test room or stage. Keyboards are used by novice and more advanced musicians as sources of different voices, sounds, effects, backing tracks or as a stock of rhythmic loops and other samples. You yourself will see that choosing the right keyboard is nothing complicated, and that it is a great choice for every beginning musician, no matter what instrument a person chooses to play on. We recommend any ordinary keyboard for the beginning (such as the brand Yamaha) with touch sensitive keys. No beginner will go wrong with such an instrument. If needed, our experts will be happy to help you make up your mind at the telephone number 020 8089 1481 (Mon-Fri 9am - 5 pm) or at the e-mail address . Touch sensitive keys means that the volume and attack of a tone is affected by the force of a keystroke, similar to a classic piano. Keyboards without touch sensitive keys are easier to control, which especially beginners will appreciate. On the other hand, keyboards with touch sensitive keys will better prepare you for the transition to piano. 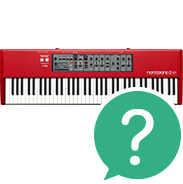 In terms of keyboard ranges, the keyboards typically range from around 5 octaves (61 keys), but this range does not have to be too restrictive due to sound processors. Keyboards are mainly used as a basic keyboard instrument to play accompaniment and melody at the same time. Thanks to the integrated sound processor, you can also use the option of a music background, automatic chords, or drum rhythms. With keyboards, you can encounter many features and parameters from which we explain the main ones. Register - The term originally taken from organ practice, means the number of sounds that a keyboard contains, thus how many piano, guitar strings synthesizers or various effect sounds such as cars and the like you can find in it. Polyphony - This value indicates how many tones or voices can be played at one time. As a rule, it is one tone to one voice, but the use of effects such as delay or reverb, can increase the number of voices of one tone. Arpeggio - is a method of playing chords where you do not play all the tones at once but one after the other. This is usually done on the keyboard wherein the user selects a sequence of tones, a time and tempo, and plays this sequence on the keyboard, usually as an accompaniment. Transpose function, dual and split - Some keys enable advanced work with the keyboard when you can divide it in the selected place and assign a different register to each half of the keyboard, so you can play the bass accompaniment with the sound of the piano, while the melody is played on the violin. Dual function allows you to assign two registers to one tone, so when one key is pressed, the corresponding tone will sound in two registers simultaneously. In some cases, the keyboard can also be transposed using the transpose function to move the shift it the selected number of tones higher or lower. Effects - Some selected instruments also have effects processors, which change the sound of a tone according to the specified parameters in real time. The most often offered effects include reverb, delay, equaliser or a variety of surround stereo. Headphone output and speakers - The big advantage of a keyboard is that it is possible to influence the reproduction volume on them so they allow you to play so that people can hear you well, but also so that you do not disturb anyone. You can either use the volume control of the built-in speakers or listen on headphones. Aux in - Some keyboards allow you to connect an external audio source, such as a CD player, iPad or smartphone, from which you can play your favorite songs and try to accompany them or play the melody. Yamaha has also integrated the Melody Suppressor function into selected models to suppress singing lines in songs and make it easier for you to play. USB output - Keyboards generally communicate very well with modern technologies, so virtually all models now have a USB interface, both for connection to a computer and for example a flash disk. With such interconnected peripherals, it is possible to save your own sound settings, your own composed and arranged songs, or upload new sounds to the keyboard. Those who work with music software will appreciate the ability to connect the keyboard though USB as a Midi controller, making it easier to arrange songs on your computer. You do not need much with a keyboard, but especially for learning purposes, you will find anote stand and good closed earphones to be useful. If you do not have an appropriate place to play the keyboard, then we also recommend buying a stand and a stool. If on the keyboard you also have a sustain pedal input (corresponds to the unmuted strings on the piano) and you do not have it in the basic accessories, then you can also buy a separate pedal. In our e-shop you can also find a number of keyboard cases in case you need to transport the keyboard somewhere. If you still feel any uncertainty about choosing a keyboard, please be sure to contact us at tel. 020 8089 1481 or at the e-mail address . Our colleagues will be glad to help you choose the right one for your needs.